Affordable Financing Options. You’re going to love how your new RV fits into your budget with financing options from Liberty RV. Did you know that when you finance through an RV lending specialist, you’ll pay the lowest down payment and will have low monthly payments as well? Typically, an RV lender will ask only 10% down on the total cost of the RV, so you can finance the majority of the cost over 15 or even 20 years. That means the RV of your dreams is within reach when you call Liberty RV at 816-415-CAMP. Call now to discuss your budget with an expert who can help match you up with the right RV. Adventure Options: Liberty RV is not another fly-by-night RV dealership that will try to sell you a travel trailer whether or not it meets your needs. Liberty deals in the biggest names in travel adventure, including Bullet, Cherokee, Arctic Wolf, Grey Wolf, Colt, Rockwood, Premier, Sanibel, WindJammer, Springer, and numerous others. Just click the ‘New RVs’ or ‘Used RVs’ links to see what’s currently available in the inventory. We’re certain you’ll find precisely what you’re looking for. Find out how you can save on Sanibel’s Blowout Clearance Event that is currently going on at Liberty RV or ask a sales agent about current specials in the inventory when you call. No other Blue Springs motorhomes dealer is able to offer prices this low on new Palomino Columbus RVs that sleep 4 and come with all of the amenities you’re looking for. The 2017 Palomino Columbus features a spectacular rear living area complete with a fireplace, space-saving kitchen island, private master bedroom and so much more. See photos of the floorpan on the Liberty RV website and check out the specs on one of the most amazing new travel trailers on the market today. You’ll save over $13,000 on this RV, making it an exceptional value in travel adventure. Liberty RV is committed to your complete satisfaction as a customer; that’s why their sales specialists will go above and beyond the everyday call of duty to help you assess your needs in determining which model will best fit your budget. If you need financing, they’ll help you with that as well. 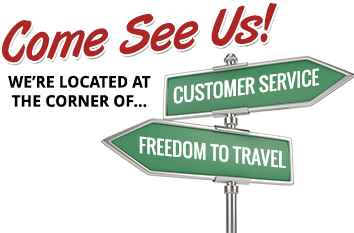 You can learn more about Liberty RV when you click on the ‘About’ and see why locals consider them the most reliable Blue Springs motorhomes sales center in the KC region. Call 816-415-CAMP to speak with someone who can answer your questions and discuss your options with you. Bring your trade-in to Liberty RV to lower your cost on a new or used travel trailer. Your next adventure awaits- are you ready to go?